Wiggle is a one stop shop for triathletes providing all the types of gear you need for swimming, cycling and running. They have now expanded their range to also include outdoors and general gym gear. Free 365 Day for Returns and Exchanges! 1. Browse through the available offers and then once you have decided on the best one for you click on the green button. This will automatically open a new window which will load the Wiggle website. The code will be revealed underneath the green button. 2. Once on the Wiggle website, add the products you wish to purchase to your shopping basket. Once you have added all of the items you wish to purchase click on the shopping basket link in the top right of your page. 3. On the shopping basket page you will need to enter your code in the box shown below. Once you have typed in the correct code click “Add Code”. 4. Upon clicking the “Add Code” button you will receive a confirmation message similar to the one below to confirm that the special deal was successfully applied. 5. Once the offer has been applied click “Continue To Checkout” and complete your purchase as normal. What if your Wiggle Bikes coupon code isn’t working? First of all check that you have exceed the minimum order value set out in the terms and conditions of the voucher code you are trying to use. You should then check that the items you wish to purchase are included in the offer, these items will again be listed in the terms and conditions of the voucher. Also make sure that the discount code hasn’t expired, the expiration date will be listed by the code. Lastly make sure that you have entered the code correctly and into the right field. It should be noted that a code can’t be applied retrospectively to an order. If you are still having difficulties please contact us so we can help you solve the problem. Wiggle Bikes offer an attractive loyalty rewards system whereby Gold and Platinum customers can receive as much as 12% off the list price. To qualify as a Gold customer you have to spend over £100 in the last 365 days and you will be entitled to 5% off the list price. To qualify as a platinum customer you have to spend over £500 in the last 365 days and you will be entitled to 12% off the list price. The spending requirement is based on a rolling basis so each order will contribute to your total spend for the next 365 days. It should be noted that items that are already discounted by more than your membership level will not be discounted any further. Nevertheless this is an extremely attractive customer rewards program offering much more than the typical points system used by other brands that typically only 1% or 2% off. Wiggle Bikes also offer a high competitive refer a friend scheme. When you refer a friend through your email link and they make an order over £50 they will receive a pair of dhb Pro Triple Lens Sunglasses for free and you will get a voucher for 10% of the value of their first order. Finally Wiggle Cycles run monthly as well as one off competitions. The monthly competitions include “Review and Win” as well as the “Wiggle Collect+ Monthly Prize Draw”. To enter simply leave a review and you will be entered into the competition for the next month where you could win a £100 voucher. 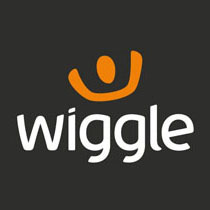 Wiggle began trading officially on the 28th May 1999 with a small investment of £2000. It started out in a spare room in the back of a local bike shop Bikes@Butlers. Wiggle started out by selling condoms and solar eclipse viewing glasses – they pretty much sold anything where there was a gap in the market. They of course also sold some of the bike shop’s stock online. Wiggle’s sales were increasing nicely and after much thought and deliberation they decided to transform Wiggle into a sports retailer and moved into larger premises in 2002. They continued to grow and were adding one new brand every week to match the increasing amounts of consumer demand. In 2009 one of the original founders sold their stake in the company and the expansion of the company continued with new offices in London in early 2011 as well as expanding their warehouse space. At the end of 2011 Wiggle was sold to Bridgepoint, a private equity investment company who were able to further expand the company into overseas markets with 11 new websites. Wiggle now employs over 350 employees most of whom are sports enthusiasts themselves. In fact there are regular staff get togethers where they run, swim and ride. Wiggle now is a specialist in the 3 triathlon disciplines of swimming, cycling and running. By being active in the sports community and hosting on average 2 events a week they aim to bring people together to enjoy life. As they are sports enthusiasts themselves, with their own CEO being an IronMan competitor they go the extra mile for their customers. They strive to offer the best service so that their customers are always happy and it shows with their long list of awards that they have won. Wiggle have a very reasonable delivery policy that gives you free delivery when you spend over £10 and will charge you £1.99 if you spend less than £10. Collect+ delivery is also available at a convenient location of your choosing for £1.99. Wiggle Cycles also offer a price match promise so that you can shop in confidence that if you find the same item that you bought somewhere else for cheaper within 7 days you can get the price difference back.